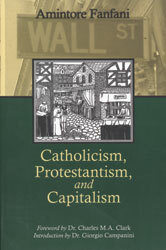 Catholicism, Protestantism, and Capitalism is one of the most scholarly and comprehensive treatments of the antagonism between Catholic doctrine and the capitalist spirit. As such it is eminently persuasive. The author, Amintore Fanfani, was the Chair of Economic History at the University of the Sacred Heart, Milan, Italy, and was the heir to a long and unmatched tradition of Italian Social Catholicism, a tradition effectively sanctioned and promoted by Popes Leo XIII and St. Pius X. Catholicism, Protestantism, and Capitalism will be of particular interest to those seeking to better understand both the preconceptions and mentalities that the pioneers of the capitalist system possessed, and the reaction of Catholicism to that system. The book demonstrates, conclusively, that there is a scholarly, intelligent, and convincing answer to the propaganda which suggests that the world is irreparably divided into two camps, the capitalist and socialist. Most welcome about this edition is the fact that it corrects a pervasive and relatively long-standing error about what the integral Social Doctrine of the Church has to say about the capitalist way of life. For far too long apologists for big business, high finance, and laissez-faire "economics" have dominated the field, and cleverly created the impression that good Catholics are, by definition, capitalists. 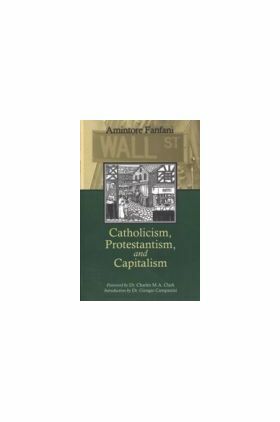 Au contraire, replies Fanfani, in this definitive exposition of the true approach to capitalsim in light of the Catholic Faith. This edition will go a long way towards correcting a record that for upwards of 20 years has been misrepresented by parties interested more in conforming the Faith to America's "business ethic" than in conforming that ethic to the Catholic Faith. Easy to read and yet scholarly, accessible and yet referencing literally hundreds of primary sources, this book will change the way Catholics think about economic life. Originally published: London, 1935. IHS is pleased to present both a coherent, helpful editor's Preface to this edition, along with contributions by two prominent, Catholic economists: the Foreword to this edition is by Dr. Charles M.A. Clark, and the Introduction by Dr. Giorgio Campanini. Dr. Charles M. A. Clark is Professor of Economics, Tobin College of Business, and Senior Fellow, Vincentian Center for Church and Society at St. John's University, New York. He has authored or edited eight books, the most recent of which is The Basic Income Guarantee: Ensuring Progress and Prosperity in the 21st Century (2002). Dr. Giorgio Campanini is Professor of the History of Political Thought, University of Parma, Italy. He has written several books on political and ethical subjects, including the Catholic political thought of the 19th and 20th centuries (covering figures such as Rosmini, Mounier, Maritain, Sturzo, and Mazzolari). His most recent book is The Burden of the Camel: the Christian Between Wealth and Poverty (2002).